SAN FRANCISCO—NanaWall Systems continues to evolve the indoor/outdoor kitchen trend by introducing its Kitchen Transition 2.0 at IBS 2015 in Las Vegas. It’s a dual-height single track sliding window/door system which opens up stunning vistas where a window-topped countertop meets a wall, allowing both windows and walls to vanish at a touch. The 2.0 version of this NanaWall innovation adds the option of zero floor track (to leave countertops pristine), fully open corners, and hidden pocketed panels. NanaWall Kitchen Transition 2.0 is a combination of the company’s sliding glass windows, which replace traditional windows over a kitchen countertop, and sliding glass ceiling-to-floor walls, which replace a wall or a typical sliding glass door. The two meet seamlessly, creating a high-style look, enhancing and expanding a living space. When open, the glass panels are able to seamlessly disappear into a pocket and out of view. 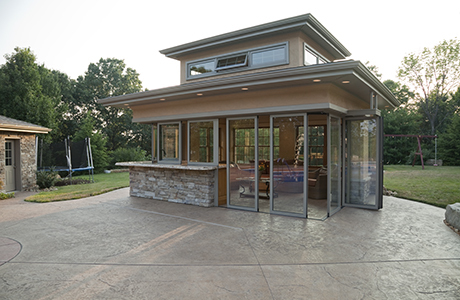 Each panel of the window/wall Kitchen Transition 2.0 opens and operates independently; any combination can be created for virtually any kitchen that faces a backyard, courtyard or deck, creating unlimited opening possibilities. Kitchen Transition 2.0 works with both wood and aluminum systems. The wood systems are available with more than ten wood options, including pine, spruce, beech, Douglas fir, oak, and mahogany. Aluminum systems are available with a durable powder coating with a choice of more than 200 gloss or matte colors.